“We work with some of the country’s leading archaeologists and local council archaeologists to carefully study each site, looking to preserve Scotland’s rich history. “If we believe that the site may be of archaeological interest we engage an archaeologist to carry out a watching brief whilst the topsoil is being stripped back by the contractors working on behalf of Scottish Water. 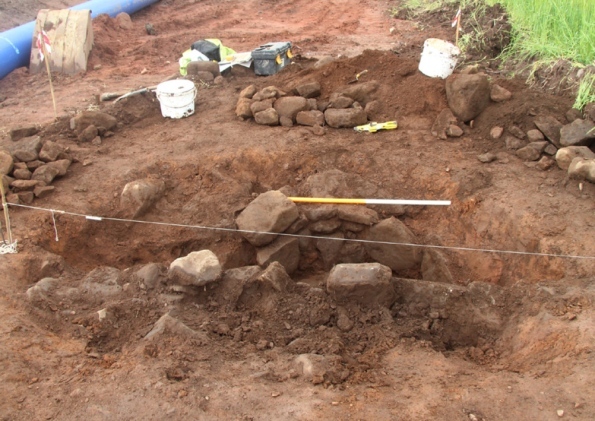 “Whilst stripping back the topsoil to prepare the ground for the new water mains being laid, the team uncovered some significant archaeological findings adjacent and outside of the scheduled monument of Duns Law Fort and Camp, north of Duns in the Scottish Borders. “Further investigations were then undertaken by CFA Archaeology Ltd, who have the knowledge and insight to cast further light on such discoveries. “The findings included the cremated bones of a woman and other fragments of human bone from at least two other adults and a juvenile. Up to seven earthen vessels from the Beaker era were revealed, each decorated with comb-impressions with different geometric patterns, which are about 4500 years old, plus a stone axe. “The burial pit itself involved a complex construction process and probably encompasses several different periods, as shown by the radiocarbon dates. “It was first dug, then two small shallow scoops excavated at the base of the pit where the vessels containing the possessions of the Beaker dead were placed and covered over. Large angular stones were also sunk into the pit. It is thought that when filled, the pit may have had a mound or cairn over the top to denote the burial ground.